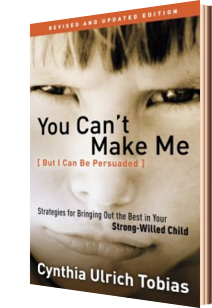 Cynthia Ulrich Tobias has revised her book “You Can’t Make Me (But I Can Be Persuaded).” I never read the original version, so I can’t really compare; but I can at least tell you what I know about this newer version. The book defines what a strong-willed child (SWC) is, and includes a checklist to help you determine just how much strong will is prevalent in your child (or yourself). We ALL have strong will. However, some of us rarely use it, and others find it impossible not to use. This book is specifically geared towards the latter - towards those kids who refuse to budge, even when given an ultimatum. It discusses how your SWC thinks, and gives practical suggestions on how to motivate him, while still keeping peace in the home. My husband and I have a 9-year-old son who is somewhat in the middle of the strong-will spectrum. We know he has a healthy dose of it, but we have learned he will generally get on board with our expectations if we approach him the right way. This book helped solidify that the most important thing is to respect our son as a person who has his own thoughts and ideas, while still remaining consistent with our own expectations and not backing down on consequences when the line is crossed. We are still in the learning process and don’t pretend to have it all figured out, but we have realized there are battles worth fighting (and winning), and others that are not. Finding a good balance is the key. So.... if you are dealing with a SWC, or just need more suggestions on how to effectively motivate your children to be the best they can be without yelling and pointing fingers at them all the time, I would recommend picking up this book. It doesn't have ALL the answers; but, it can help by providing some helpful suggestions to frustrated parents, grandparents, and teachers. I received this book for free from WaterBrook Multnomah Publishing Group for review purposes only.